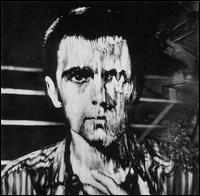 Peter Gabriel is an enigma wrapped in a riddle. He's a musical genius, but he's also extremely eccentric. This leads to some weirdness sometimes, but most of the time, it's pure magic. This album, Gabriel's third eponymous and third post-Genesis album, is excellent. Not only because of the cowbell on multiple songs, but the songs are fantastic. "And Through the Wire" is no excepetion. This song's unique because it starts out with the chorus. The cowbell comes in during the repeat of Chrous I, following the first verse. I'm actually pretty sure that the cowbell represents the metronome that is referenced in the lyrics of the first verse. I suppose it could also represent his heartbeat. During the first two lines of the second, the cowbell actually moves from right to left in the track. And during the first two lines of the third verse, it moves from left to right. It's a very cool effect. I highly recommend headphones and increasing the volume. Finally, the guest lead guitar by Paul Weller is the icing on the cake that is this great love song.